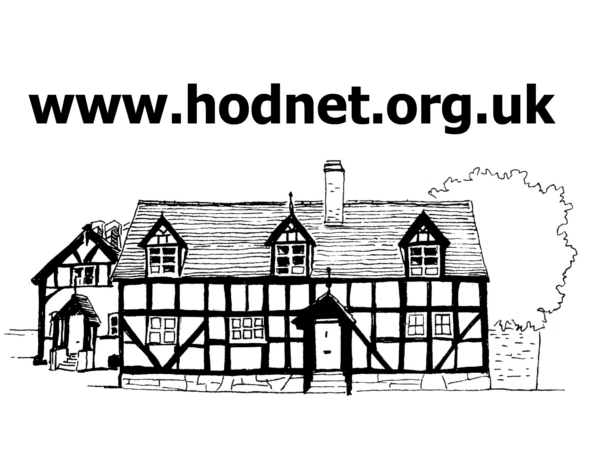 The Hodnet Footpath Group have produced ten leaflets outlining some varied walks in the local area – for the benefit of residents and visitors alike. A new general ‘Guide’ leaflet about all our walks/our work is also available. The walk leaflets follow local footpaths, some ancient/some modern, or country lanes – with one focusing just on the historic buildings/sites within Hodnet village. The front of each walk leaflet contains an indication of the nature of the walk (circular or linear); the approx milage; the walk ‘Grade’ (level of fitness required); whether or not the route is wholly or partly ‘dog friendly’ and the expected duration (hours). Printed copies of the leaflets are available in various local outlets, but all can be downloaded below. A brief description of each walk is shown below. Although each walk has a nominal start/end point, the routes can of course be walked in reverse order, or started midway – the choice is yours! Please click on the image of each leaflet (below) to download it as a PDF file. Note. Most or our walks at some point involve access to/through farmers fields. Whilst we encourage landowners/farmers to observe their legal obligations to keep paths and stiles clear, depending upon the level of use and the time of year paths in fields containing growing crops may be difficult to navigate. Where such paths pass along the field edge, walkers are advised to minimise crop damage by trying to walk instead, where practical, in the ‘tramlines’ between crop rows; but where a field has to be crossed, walkers are advised to take the most direct [or existing trodden] path between field edges, ideally following the route shown on the leaflet maps. In the event of extreme difficulty/obstruction, please get in touch with the farmer, where known, or let us know of the problem. If you come across nettles, brambles and bushes/trees, etc, obstructing/overhanging stiles, etc, you can do your bit – to help others who may follow – by trampling them down, or by cutting/snapping them off. Please click on the image of each leaflet listed to download it as a PDF file. This leaflet summarises our ten walk leaflets; showing their titles, general routes/starting points plus an explanation of some terms used, and also gives some general information on walking and how to deal with/report problems. This circular (part linear) walk starts at the Hodnet Social Club (free parking). It primarily takes you along part of the former Wellington to Market Drayton railway line where, late on a warm evening (at the end of June/start of July) a colony of glow-worms can be spotted – the females displaying a light (glow) to attract mates. For those who prefer a circular walk, the route can be extended along country roads past Wollerton Old Hall, then crossing the Hodnet Bypass before returning to Hodnet via Station Road. Alternatively, with a second extension it can include Websters Lane and a walk across fields back into the village. This circular (part linear) walk starts at the Lyon Hall in Hodnet (free parking). The walk sets out up Hearne Lane and then climbs higher across fields to the crest of the hill with a panoramic view of the North Shropshire countryside. Walkers can then follow Long Lane down into Wollerton; and from there the route follows pavements around Wollerton or a field path across its middle, to an unsuual brick animal pound. This is close to Wollerton Old Hall and walkers then have the choice of following the old railway line back to Hodnet or following a longer route – which crosses over the bypass. Starting again at the Lyon Hall (free parking), this circular (part linear) walk heads first through the top part of the village, before turning right at the ‘Rocking Horse Shop’ and going up the hill to Marchamley. About two-thirds of the way up the hill is the start of the ‘Permissive Path’, created a few years ago, which runs along the edge of the field to the outskirts of Marchamley. From this path there is an impressive view of the area towards Telford and the Wrekin. Those looking for a short walk can turn around at Marchamley or down Long Lane, which provides a further viewpoint, to return across fields to the Lyon Hall. This walk follows no fixed route, but the leaflet identifies various buildings/places of historic interest to be found in the village of Hodnet. Some of these are located in the grounds of Hodnet Hall and can only be accessed on the days the grounds are open to visitors (details on the Hall’s own website – see below). Originating in Anglo Saxon times, the village became more important with the building of a Norman castle, now just a mound obscured by trees. Today its character is enhanced by a large number of 16th & 17th century timber-framed, black and white buildings. Originally these were thatched, but now just one such roof remains. Starting at the Wollerton Village Rooms (free parking), this circular (part linear) walk goes to the Wollerton Wetlands via a recently reinstated ‘missing’ path – part of which passes down a lane known locally as ‘Cow Lane’. When you reach the river Tern cross the footbridge and you’ll find yourself in the Wetlands – which were created when the A53 bypass was built. The paths around the Wetlands were overgrown for some years [due to limited access] but were later cleared by Shropshire Council’s Outdoor Recreation Dept assisted for a time by a couple of Shropshire Probation Service work parties. You can explore the various pools and surrounds, keeping a watch for wildlife of all kinds – birds and insects abound. Otters live in the river and no doubt visit the Wetlands too. Even though it’s right by the bypass, it is a surprisingly quiet spot. Those who want a longer walk can follow the riverside path under the bypass towards Stoke Heath via Helshaw Grange. One of our longer walks, this linear walk (part circular) passes through varied countryside between the villages of Hodnet and Fauls. Starting at the Lyon Hall car park (free parking), the route goes up Hearne Lane and climbs the hill to Long Lane [as per walk leaflet 2] but then crosses Long Lane and heads towards Marchamley Wood and the onto Fauls. It provides great views of the North Shropshire countryside and as you near Fauls the distant Welsh Hills – inc Briedden Hill. Fauls has a pretty Churchyard and sits in attractive countryside. Various options are available for the return leg. This circular walk starts at the Holy Immanuel church in Fauls (free parking). On a clear day it provides views of the Hawkstone and Welsh hills as well as towards Market Drayton, Loggerheads and towards North Staffs/Cheshire – where on a very clear day you can see as far as Mow Cop and the Jodrell Bank radio telescope. It also passes by Hoarstone Lake with its wildfowl, rabbits and, maybe, an odd angler or two! The full routes is about 5 miles long, but a short cut offers an easier 1 mile stroll. This circular walk starts at the fomer ‘Old Club’ (free parking) and heads across fields to pick up a country lane leading to ‘Peplow Crossroads’. From there more lanes and field paths take you to Hawgreen, where you pass a pretty pool at Hawgreen Farm. Field paths then take you back to High Hatton – where an optional extension can add a pleasant further mile and half to your walk. This linear walk starts at Peplow’s chapel of the Epiphany (free parking) and takes you across largely unseen and varied countryside, up the river Tern valley, until you reach St Peter’s church at Stoke on Tern. Cars can be parked at St Peter’s (free parking) to enable you to walk the route in reverse; or if two cars are used (and parked at each end) you can walk the route just one way. This linear walk starts by Webster Lane Farm (aka ‘Ashley’s Farm’) on the edge of Hodnet (free parking). It passes down the side of Tunstall Woods and then goes across varied countryside to end by Tunstall Farm – although there is no right of way to the farm or beyond. In season, usually May, there is a nice display of native bluebells in part of the woods, plus other wild flowers. For more information on the Hodnet Footpath Group and their activities please visit their page.